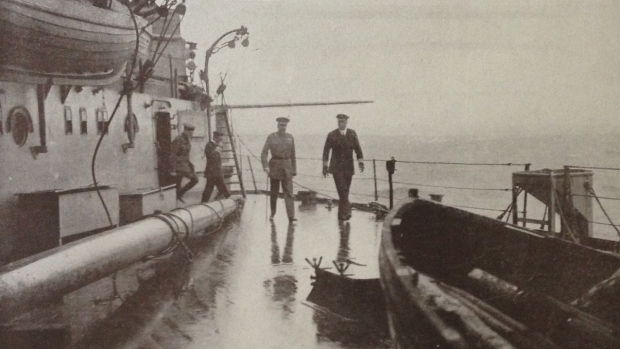 Today marks the Centenary of the sinking of HMS Hampshire with Lord Kitchener on aboard. On 5 June 1916, HMS Hampshire left the Royal Navy’s anchorage at Scapa Flow, Orkney, bound for Russia. The Secretary of State for War, Lord Kitchener, was on board as part of a diplomatic and military mission aimed at boosting Russia’s efforts on the Eastern Front. At about quarter to nine in the evening, in stormy conditions and within two miles of Orkney’s northwest shore, she struck a mine laid by German submarine U-75. There were at least 28 Irish sailors lost on HMS Hampshire. One of them was the ship’s surgeon, Dr Hugh Francis McNally from Belfast, son of the principal of Raglan Street Boy’s School on the Falls Road. McNally, an ex St Malachy’s pupil had studied Medicine at Queen’s University and was a member of the Queen’s Officer Training Corps. He joined the Irish National Volunteers at its formation and was immediately appointed company officer. On the retirement of Captain Berkeley he was appointed Commander of the Belfast Regiment with the rank of Lieutenant Colonel. At the start of the First World War, he joined the National Volunteers. He was a magnificent organiser, and was responsible for the 1915 parade in Dublin. Newspaper reports at the time note that he ‘his name will always be remembered by the Belfast National Volunteers with the kindliest feelings’. On receiving his degree from Queen’s University, he joined the Royal Navy, giving his service ‘in the cause of humanity’. The sinking of HMS Hampshire was a grievous blow to the Allied war effort. The British Empire lost Lord Kitchener, the Secretary of State for War, whose organisational ability ensured that Britain had an army, of sufficient size, to be able to stand alongside her Allies in a major European conflict. Kitchener was a personality who was instantly familiar to all British people, both young and old, whose death was mourned as if he had been a close relative. In addition to the crew, who numbered around 650, was Kitchener’s delegation, consisting of military officers, politicians and their staffs, who also went down with the Hampshire. Only 12 men, all from the Ship’s company, survived the disaster.